The Baktrion Agema is the elite infantry of the Baktian kingdom. The Baktrian kingdom had its own elite guard, shown so beautifully in golden statuary throughout their prominent enclaves. These men are armed with spear and blade, and armored in a tough cuirass and boeotian helmet of a design unique to their corps. They are the elite infantry of Baktria, and form the bulwark of Baktria's opposition to its rabid enemies. They are a versatile phalanx, adapt at their prescribed task, but equally profficient when charging as melee fighters. 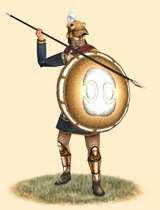 Historically, the Baktrians had a lack of professional guards, which they tried to rectify by training recent arrivals from independent and semi-autonomous Greek settlements outside of their kingdom, seeking a secure region for protection after their succession from the Seleukid kingdom. These Greeks eventually formed the nucleus of this powerful and feared group of soldiers, which was later supplimented by local Greeks.